The Lower Modernisms – 052. Snacks of the Lomo Future. September 28, 2013 by James Black. Foodstuffs may seem outside the scope of the Lower Modernisms, but they can be a designed product, the culmination of the coordinated efforts of many, with artistic, commercial and cultural impacts often analogous to those of buildings. The term “Modernist Cuisine” refers to a technical and scientific approach to food preparation and brings to mind the sous-vide process, freeze-drying, and gels – experimental, futuristic styles found in highbrow venues. Lomo snacks are the lowbrow counterpart to modernist cuisine. In contrast with food that is grown, these innovative edibles are designed, engineered, tested and marketed, and represent the collected intelligence of vast teams. Futurist in a populist fashion, lomo snacks had their heyday during the same 1960s-1970s period that saw the flourishing of lomo aesthetics in other disciplines. 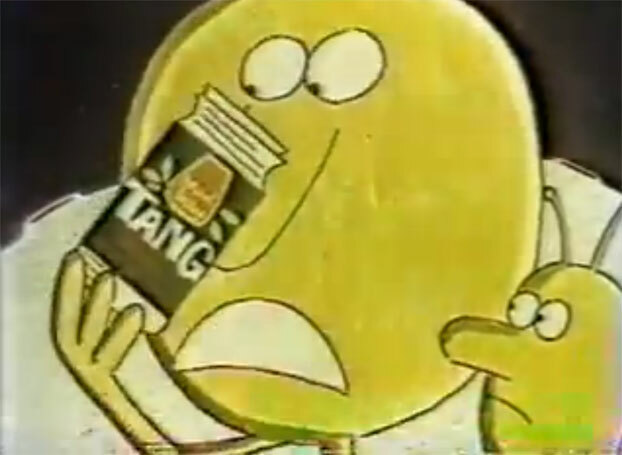 Not coincidentally, many of the exemplar lomo snacks originated during this period, such as Tang (1959, “For Space Men and Earth Families”); Pringles (1967, “Made a Newfangled Way from Dried Potatoes”); both Munchos and Funyuns (1969); Chicken McNuggets (1979, “You Deserve a Break Today with Chicken Cooked the McDonalds Way”); and Dippin Dots (1987, “The Ice Cream of the Future”). These lomo snacks tend to share four defining characteristics. 1) A modernizing graphic design aesthetic and market positioning (following a basic principle of the Jaunty tendency, most of the products named above made use of letters staggered up and down from their baseline). 2) Technological, or at least industrial, connotations. 3) Artificiality (these snacks are a simulacrum of real, pre-existing foods). 4) Unwholesomeness (ideally, deliciousness is achieved through an excess of saturated fats). For case studies I took a closer look at Frito-Lay’s masterpieces of the late-modern era (and among my favorite forms of sustenance throughout middle school), Munchos and Funyuns. 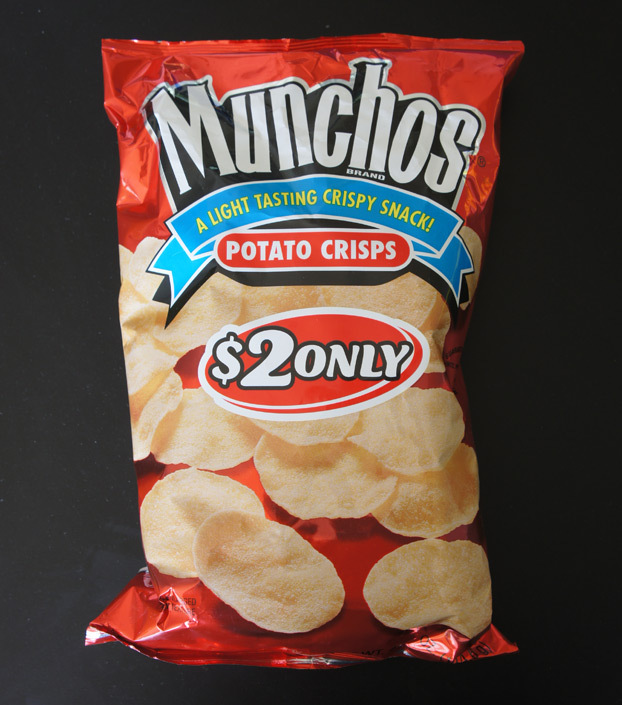 The light-tasting potato crisps Munchos seem to have fallen out of favor in the marketplace. Now relegated to Frito-Lay’s “$2 only” series of discount chip products, Munchos belong on the Endangered Lomos list. 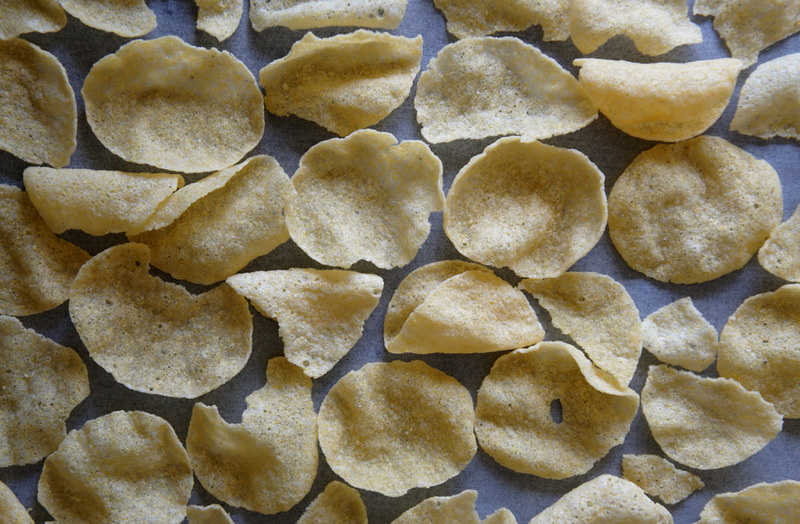 This is no great wonder, because they are pretty gnarly – the crispiness and mouthfeel are satisfying and robust enough to scarify the lid of your mouth, but they taste like salty stale air with just the slightest whiff of potato. A little web browsing shows that the history of Munchos is intimately tied to that of Pringles. 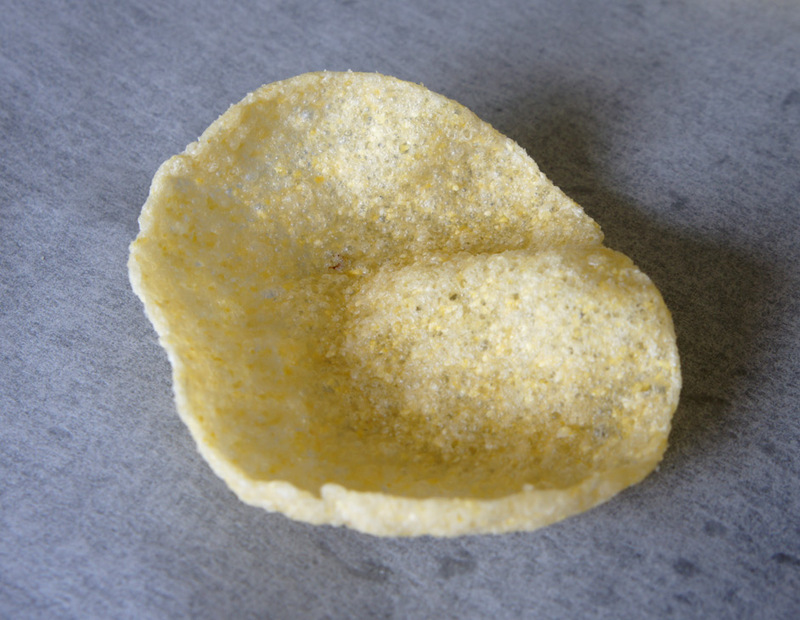 As outlined in the Pringles Wikipedia page, the Pringle was a marvel of modern industrial design – Proctor & Gamble identified that there were logistical inefficiencies in the way potato chip bags were delivered because air makes up the majority of the bag’s volume and careful handling is required to prevent broken chips. Aiming to solve these problems with technology, P&G tasked chemist Frederic Baur with the problem in 1956. By 1958 he had invented both the hyperbolic paraboloid chip and the cylindrical can, but only years later did P&G figure out how to make them taste good. 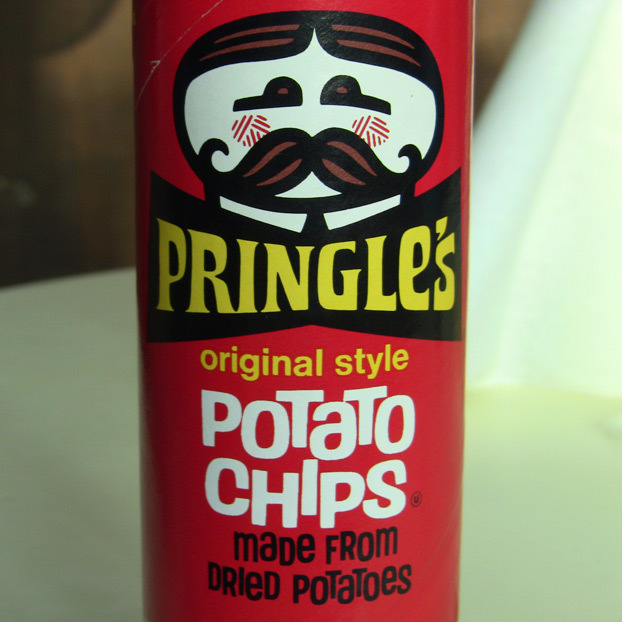 A decade in the making, Pringles finally launched in 1967. Pringles are marketed today in the United States as “potato crisps,” allegedly as a result of a successful Frito-Lay lawsuit to prevent the competition’s synthetic chips from being called potato “chips.” P&G has recently played this to their advantage, arguing in the British courts that their product, only 42% composed of potato, should be exempt from the Value-Added Tax charged on potato chips (which are ironically called “crisps” over there). But Frito-Lay also chose to play it both ways, and by 1969 had developed the Muncho to compete with the Pringle in the demographic of people creeped out by the offensive naturalness of traditional potato chips. 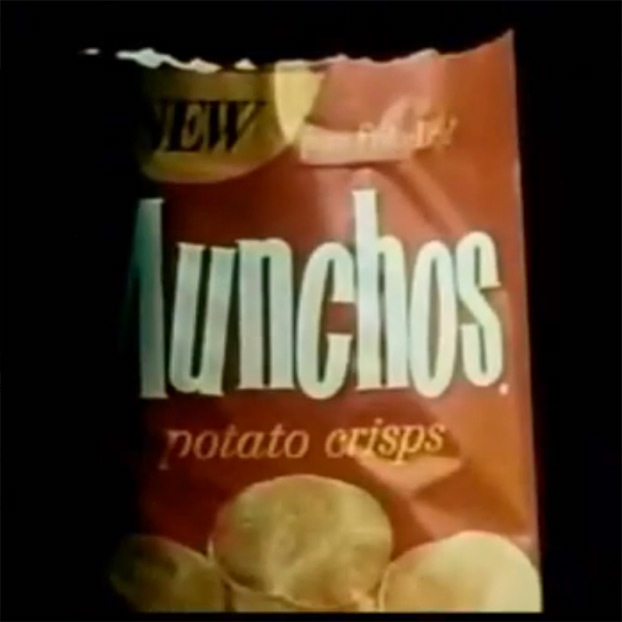 As seen above in a snapshot from a 1972 television commercial, Munchos made use of a jaunty logotype, made up of extra-condensed letters, tightly kerned, with letters both up and down from their baseline and also alternately tilted. The unrestrained logo suits well the formal qualities of the chip. In contrast with the buttoned-down Pringle, every one of which is identical to its brother, the Muncho is a manifestation of chaos. Somehow the pulped-and-formed formula allows for tight radiuses and compound curves not achievable by ordinary sliced potato matter, giving the Muncho a distinct fingerprint. Although Munchos both taste worse and allegedly cost more to manufacture than traditional potato chips, they have diversified Frito-Lay’s lineup; and with the legalization of marijuana right around the corner, Munchos may yet have a comeback. 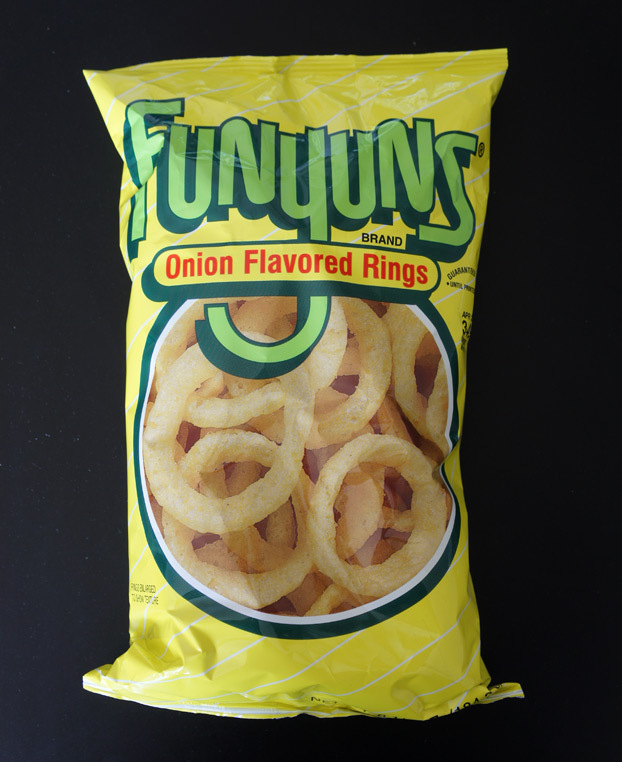 Funyuns were also launched in 1969. Inspired by the onion ring, the Funyun is an onion-flavored ring of extruded and fried cornmeal, loaded with enough onion powder to make them compelling. Throw in a can of Sprite and a package of Hostess Crumb Donettes, and you have my favorite lunchtime meal of my middle-school years. 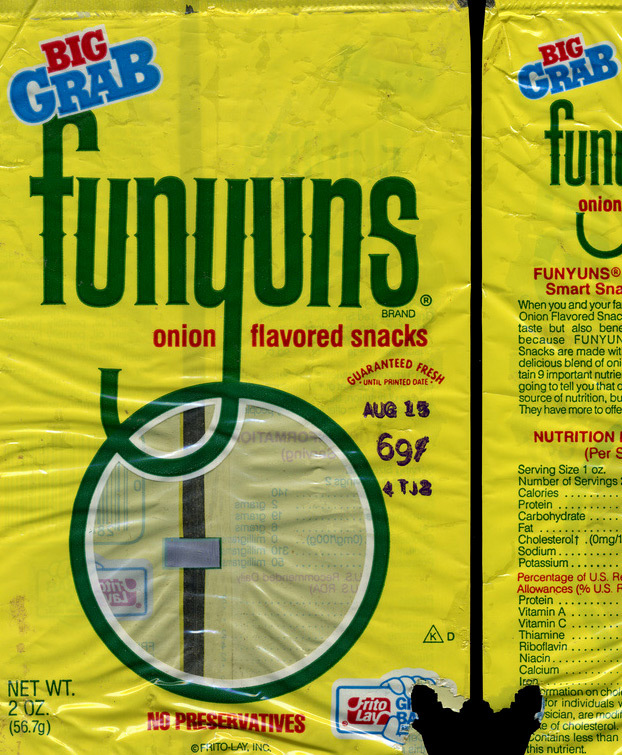 The older Funyuns logotype shared similar jaunty qualities with that of Munchos. The condensed, slightly serifed typeface is closely kerned. The letters hold the baseline, but every other letter is subtly tilted left or right. Spelling “funyuns” in lower-case letters produces a jaunty rhythm by dint of the letters alternating having a radius at top or bottom, an effect wholly lost in the newer logo. 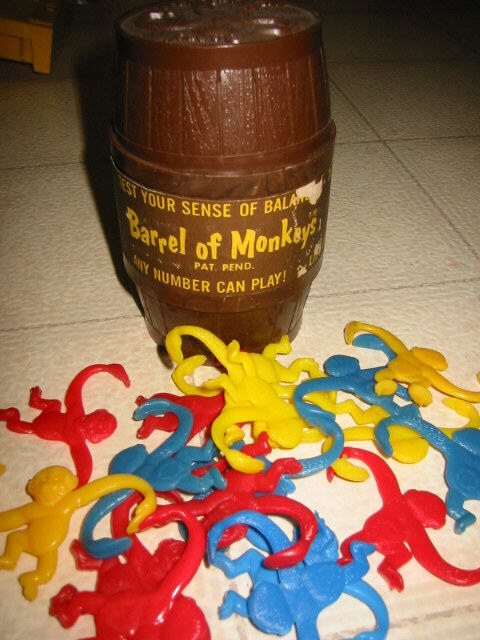 The extended tail of the “y” references the form of the Funyun itself, and their tendency to interlink like a Barrel of Monkeys. 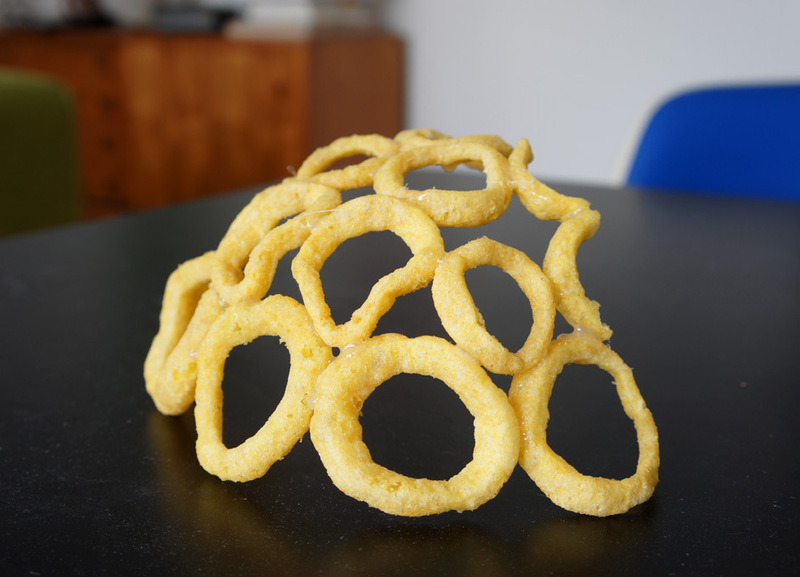 I queried the Funyun as to what it wanted to be and then explored its architectonic qualities by attempting to build a geodesic Funyun dome, but there were too few Funyuns both uneaten and unbroken remaining to allow this oeuvre to be completed. As stated in the foregoing, these lomo snacks represented a lowbrow alternative to the aspirations now found in modernist cuisine and molecular gastronomy. Whereas the latter appeal to a niche market, the lomo snacks developed in the 1960s and 1970s were populist, aiming for a low common denominator and the mass market. This tradition carries on today but has transmuted, the best mass-market examples being familiar foods that imitate the flavors of other, unrelated foods – Lay’s recent foray into Chicken and Waffles-flavored potato chips, and the hundreds of KitKat flavors offered in Japan, for example. The Hot Dog Stuffed Crust Pizza might be a revolting thought, but it is also an object that crystallises a trope of contemporary design culture. Its appallingness has a purity to it, a clarity that reveals tendencies that often lurk below the surface of design, hidden by good taste and convincing rhetoric. Jacobs positioned the HDSCP as a kind of uncanny mash-up that reflects contemporary cultural conditions. Certainly it appeals to designers because it is Diagram Food. Although it may be symptomatic of its time, the HDSCP also reflects contemporary retro instincts, tapping into the legacy of the lomo snack tradition.